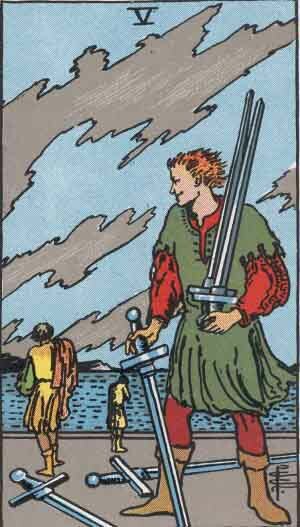 Today’s Yesterday’s card is the Five of Swords. Three people walk their separate ways, after some kind of disagreement. The one furthest in the background holds their head in their hands, dejected; in the midground, another walks away with dignity. Standing fore is the subject of this card, holding the swords of their former companions. They grin, smugly, the victor of some kind of argument – but at what cost? 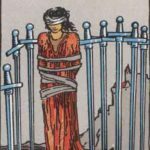 The Five of Swords is all about dishonor, lies, and trust-breaking. 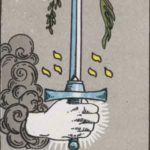 By betraying their comrades, the subject of the card now holds all the swords – but what use are they without friends to hold them? 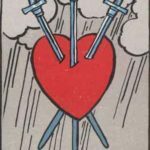 When drawn in a reading, the Five of Swords warns us of a potential back-stabber in your midst… one that might even be you, yourself. 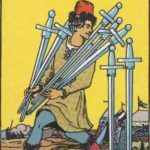 Be conscious of how you treat others, lest you find yourself holding all of the swords by your lonesome.